Scratch Scenius in Practice — Wonderful Idea Co.
Last week I attended the Scratch Conference at MIT Media Lab, a gathering of teachers, learning designers, and researchers interested in developing their practice of teaching and learning with computers and code. It was super inspiring to once again connect to this vibrant community and learn together with so many people that I admire. The theme of the conference was "the next generation" which could be interpreted in several ways. It was firstly a celebration of the upcoming new version of scratch (the scratch 3.0 beta launches on Rugust 1st) which has many updated features including more links to the physical world. As well, the keynote on the last day hosted by Ricarose Roque featured the stories of young people who have grown up using scratch and now are spreading the joy of playful coding and allowing new generations to discover their own ideas! But one thing that I noticed and appreciated was that while eyes were turned to the future of the scratch programming language, there were many reminders of the values at the core of the experiences. The Scratch conference both respects and remixes the legacy of thinkers like Seymour Papert, Cynthia Solomon, Edith Ackermann and others, builds on the hard work of the Mitch Resnick, Natalie Rusk and the LLK team over the years and celebrates the diverse network of teachers, librarians, artists, academics and designers who have made enourmous contributions to the community. Both of the hands-on workshops that I helped to lead on Thursday were new experiments that built upon the ideas of others. Our first workshop was a translation of a Flat Game Jam, a day-long experience where participants make expressive exploratory games using hand drawn characters and backgrounds. The idea was first developed by Irish artist, designer and video game maker Llaura McGee (DREAMFEEL) and I fell in love with the possibilities of people coming together with different experience levels and embracing the process of combining unique physical and digital elements. We worked with Becca Rose to host a Flat Jam in Oakland last summer which was really fun! In that event we created games in Unity programming langage. For the workshop at MIT we wanted to see if we could capture some of that experience using scratch to construct our games. I collaborated with Ryoko and Deanna from the Tinkering Studio to set up the workshop and we were really honored to be joined by K-Fai Steele, illustrator of the Chibitronics Love to Code book and guide to chibichip. There was something really cool about having a professional illustrator there to help guide the experience and she started us off by having the group create blind contour drawings of each other. Next we made use of a wide range of art materials and techniques to hand draw sprites and backgrounds for projects that had the theme of a memory of 'how you got to the conference'. After about 10 minutes of just making the physcial art, we began to import the assets into the scratch environments. There were some challenges with how to take good photographs and using the magic wand or eraser function in the editor to remove the background. But once people embraced the imperfections of the medium, they started having fun creating their stories. Ryoko and Deanna showed off some of their experiments with video sensing which can be used to aqdd complexity to the projects. At the end of the half hour session we shared our creations in a scratch studio and talked a little about ideas for integrating this idea into classrooms, museums or afterschool programs. The second workshop of the day was "Sensor Garden" a take-off of an old idea from the PIE (playful inventions & explorations) project that used the PICO cricket to create an interactive electronic garden. Angela and Giuseppe from Coder Dojo Bologna worked with me to create a new version of the activity where participants could choose between experimenting with Chibichip, Micro:bit & Moto:bit, or Makeblocks to contribute to a garden installation with flashing LEDs, pressure sensors, DIY switches and moving elements. 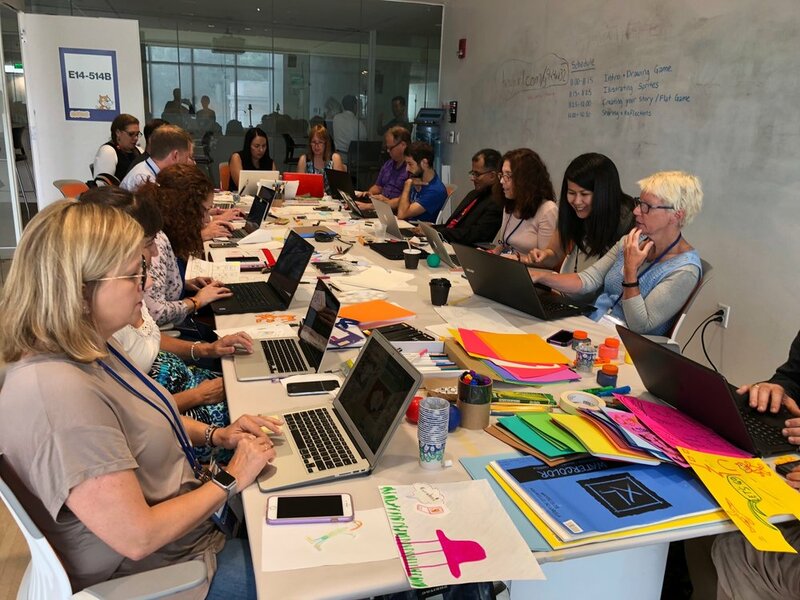 This workshop was a chance to share ideas and experiences from the last couple weeks of summer camp where learners used many of these tools to create their own designs. It could be a little overwhelming to have multiple microcontrollers and programming languages available but I think that it opened up many next possibilities for new ideas. The day before we had made four or five examples that showed simple uses for lights, motors and animations and we started our workshop by checking out the different options. The group divided into pairs and chose the a tool to start with. It was super fun to see how people could just jump into the prototyping process. It was pretty easy for most to get a motor or light working but from that point the ideas complexified in many different directions. One group worked to create a connection between a pressure sensor and a servo motor for a bird's nest, another project was a spinning water fountain with lots of craft materials and another group worked on building a moving wheelbarrow contraption. I was impressed that a couple of groups incorporated both the microbit and the chibichip into their projects. One of the creations had a sunflower attached to the motor and a fading sunset/sunrise chibitronics projects suspended from the ceiling. Another group worked on a alien garden gnome with a rotating head and blinking LED eyes. Although there was only about an hour for participants to work on their creations we came together for the last 20 minutes or so to share work in progress and reflection on the experience. It was great to see the wide range of ideas and moments of frustration, joy and pride that the group went through while making their projects. The experience reinforced some ideas that we've been working with this summer as we've been exploring creative coding and computational tinkering. First off I think it's imporant (especially in a shorter timespan) to have an open-ended theme like a garden or undersea scene so that although there are many options, participants can quickly think up something that fits. And additionally it's important to have a way for learners to contribute to something larger than their individual projects. Building a collaborative installation both provides a bit of external pressure while allowing each group to work individually on their own creation. It's especially important to introduce a social scaffolding while working with computation since programming can be misunderstood as a solitary excercise. The day after the workshops, there was a keynote presentation by author and illustrator Austin Kleon that reinforced some of these ideas. 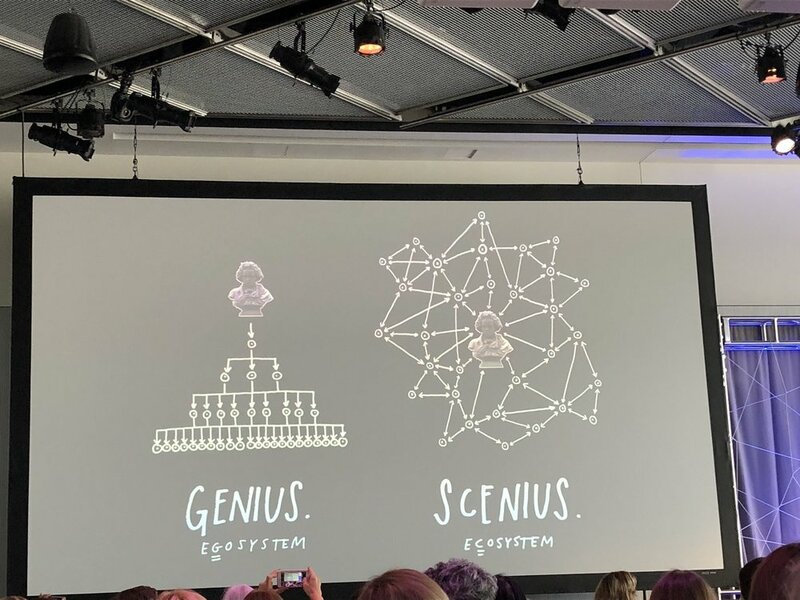 He spoke about stealing ideas and making them your own as an artist, something that can be employed by educators and learning designers as well. 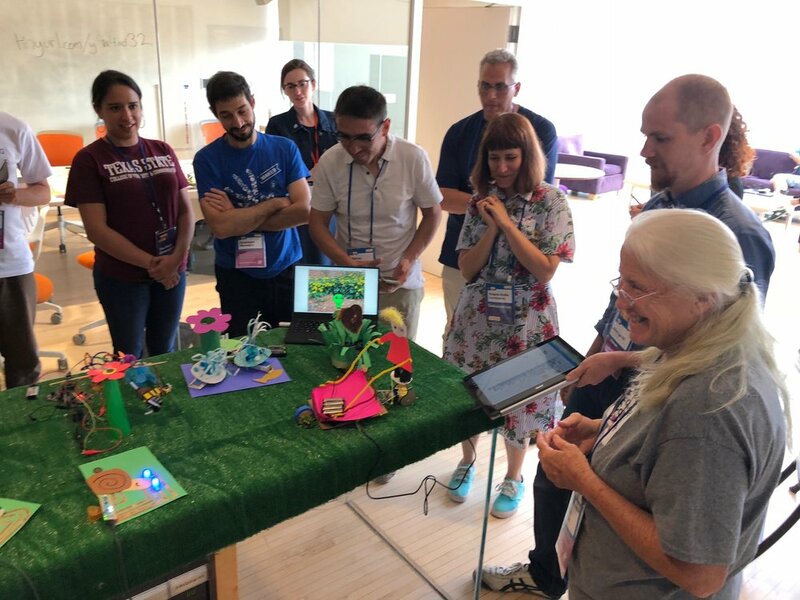 Both the sensor garden workshop and flat scratch jam were ideas that we borrowed from others and tried to give new life and context at the conference. The presentation set up the distinction between thinking about innovation as coming from the lone genius and understanding that new ideas often come from a "scenius", which he describes as “a whole scene of people who were supporting each other, looking at each other’s work, copying from each other, stealing ideas, and contributing ideas.” I feel fortunate to be a part of the Scratch scenius and I'm looking forward to seeing how these ideas are transformed and remixed by friends and colleagues the community.